Born: March 1851, Port Royal, Jamaica. Died: 13 April 1920, Grahamstown, South Africa. William (Willie) Tyson, teacher and plant collector, was the son of Reverend William Tyson, a Wesleyan missionary. For some time he studied medicine at Leeds, England, but had to abandon his studies because he suffered from arthritis, a disease which plagued him throughout his life and later deformed both his hands. He did, however, win a prize in botany, a subject in which he remained strongly inerested for the rest of his life. Though his disease embittered his outlook, he retained an indomitable energy and an enthusiasm for science. Aroung 1874 he and his parents emigrated to the Cape Colony, where he worked as a teacher while collecting plants in his spare time. The family settled in Grahamstown, where Reverend Tyson, his wife and William were all elected members of the Albany Natural History Society on 25 August 1875. Later William accepted a teaching post at the South African College School, Cape Town. He was elected a member of the South African Philosophical Society in June 1880. 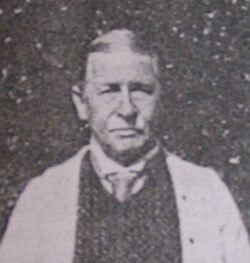 From January 1880 to June 1882 he taught at Hex River. For the next four years he was in Griqualand East, teaching at Kokstad and as a private tutor at uMzimkhulu. During these years he was one of the main contributors of plant specimens to H. Bolus* and P. MacOwan* for distribution to institutions overseas. From July 1886 to December 1887 he taught at Dale College, King William's Town, and at the Grey Institute, Port Elizabeth. Early in the next year he spent some time in Kimberley. During these years he collected mainly at Port Elizabeth (April-November 1877), Murraysburg, Cape Town and Hex River (January 1880 - June 1882), Griqualand East and Pondoland (July 1882 - July 1886), and King William's Town (July 1886 - December 1887). In the preface to Volume 6 (1897) of the Flora Capensis the editor, W.T. Thiselton-Dyer*, thanked him for a large and interesting collection of plants from the eastern districts of the Cape Colony, Griqualand East, and Pondoland, containing numerous new species. On 16 May 1888 Tyson was appointed in the Department of Agriculture of the Cape Colony, serving as clerk and assistant to the superintendent of woods and forests, Count de Vasselot de R?gn?e* (until 1891) and his successor, D.E. Hutchins*. This position gave him an opportunity to visit the colonial forests. In July 1894 he was appointed in the Department of Agriculture as assistant editor of the Agricultural Journal of the Cape Colony (the editor being J.B. Hellier*), holding this post until it was abolished in 1904, when he retired on pension. From about 1900 to 1904 he also served as librarian to the Division of Botany of the Department of Agriculture. He sold his herbarium of flowering plants to the Cape Government Herbarium (now in the Compton Herbarium, Cape Town) in 1892, but retained his collection of marine algae. These he continued collecting, mainly for the British Museum (Natural History). Miss Ethel Barton of that institution published a list of South African marine algae, including specimens from Tyson, in 1893. She named the species Aristothamnion tysoni after him. In 1898 Tyson collected a set of 13 plants of the genus Gentianeae (family Gentianaceae) for the Government Herbarium. These were sent to Berlin for identification and were described by E. Gilg that same year. At this time other plants collected by him were also described in the literature. For example, new species of Labiatae (M. G?rke, 1898) and new species of Campanulaceae (L. Diels, 1898). During 1908 he spent time at the South African Museum working in the Government Herbarium on the plant collections he had made in Griqualand East and added many specimens to the collection. The next year he worked through the collection of marine algae. In April 1910 he took on the duties of a botanical assistant at the herbarium for a period of ten months, while E.P. Phillips* was overseas, and a further set of his marine algae were incorporated in the collection. Thereafter Tyson settled at Port Alfred, where infirmity prevented him from leading an active life. However, with the help of young friends he managed to build up a large collection of marine algae, several sets of which he offered for sale to herbaria. He also issued two lists, each containing 50 species of algae, but was unable to complete further issues. His collection of marine algae was purchased by the Bolus Herbarium, University of Cape Town, and is kept there as the "Tyson Collection of Marine Algae". Good sets of his plants can be found also in the herbaria of the Albany Museum, Grahamstown, and at Kew Gardens, near London. There are also specimens from him in the National Herbarium in Durban and Pretoria, and in the British Museum (Natural History). He was extremely careful and neat in the preparation of his specimens. As late as 1919 he contracted to collect plants for the Botanical Survey of South Africa, directed by I.B. Pole Evans*. However, his health deteriorated further during his first collecting trip to Coffee Bay in September 1919 and he came back to Grahamstown, where he died. Tyson was a Fellow of the Linnean Society and one of the most indefatigable plant collectors of his time. His name was mentioned often in the later volumes of the Flora Capensis. The genus Tysonia (family Boraginaceae) was named after him by H. Bolus*. He was also commemorated in the names of many species that he collected, but most have since been renamed. His interests in the natural world were not limited to botany, for in his later years he also collected marine shells, insects and other small animals, and many naturalists visited his home in Port Alfred. Albany Natural History Society. Minute Book, 1867-1875. (Albany Museum (Natural History), Grahamstown). Barton, E.S. A provisional list of the marine algae of the Cape of Good Hope. Journal of Botany, 1893, Vol. 31, pp.202-210. Cape of Good Hope. Civil service list, 1889, 1894, 1896, 1898, 1899, 1901, 1903. Cape of Good Hope. Report of the Colonial Botanist, 1892, 1898. National Automated Archival Information Retrieval System (NAAIRS). . Documents relating to Tyson, W.
Obituary: William Tyson. South African Journal of Natural History, 1920, Vol. 2(2), pp. 288-290. Schonland, S. [Obituary]: W.Tyson, FLS. Annals of the Bolus Herbarium, 1923, Vol. 3, pp. 120-121. South African Philosophical Society. Transactions, 1880-1883, Vol. 2-3: Minutes of proceedings and lists of members.